El Paso, Texas, is a proud sports city. With more than 300 sunny days a year, locals enjoy a variety of outdoor pursuits, including hiking, running, cycling, soccer and football, spread out through the beautiful desert area. El Paso is an outstanding golf community with a number of public and private golf courses offering year-round playing opportunities. And the city is host to various amateur, regional and national sporting events. The University of Texas at El Paso has a long sports tradition, dating back to when the school was called the Texas College of Mines, and later Texas Western College. It is home to the 1966 NCAA National Basketball Championship team, coached by the legendary Hall of Famer Don Haskins. Haskins started five black players the night Texas Western won the title over the University of Kentucky, which was unprecedented for the sport at the time. A movie about Haskins’ historic decision and the feat of the Miners is the subject of the major motion picture by Disney, “Glory Road,” which stars Josh Lucas as Haskins and features scenes from the El Paso area. El Paso is the home of a number of well-known golfers, including Kristi Albers, Rich Beem, J.P. Hayes and Lee Trevino. Albers, a former All-American, All-Conference player for the University of New Mexico, won the 1993 Sprint Classic on the LPGA Tour and is a member of the El Paso Hall of Fame and the Golf Hall of Fame. She also formed the First Tee of Greater El Paso, a youth golf organization, and still lives in El Paso. Beem won the 2002 PGA Championship in a one-stroke victory over Tiger Woods, while Hayes, a former UTEP golfer, won the 1998 Buick Classic and the 2002 John Deere Classic. And the legendary Trevino, who won 29 PGA championship titles over 16 years, and 29 PGA Champions Tour titles over 10 years, got his start as a golf pro in El Paso back in 1960. A major street is named for him in East El Paso. 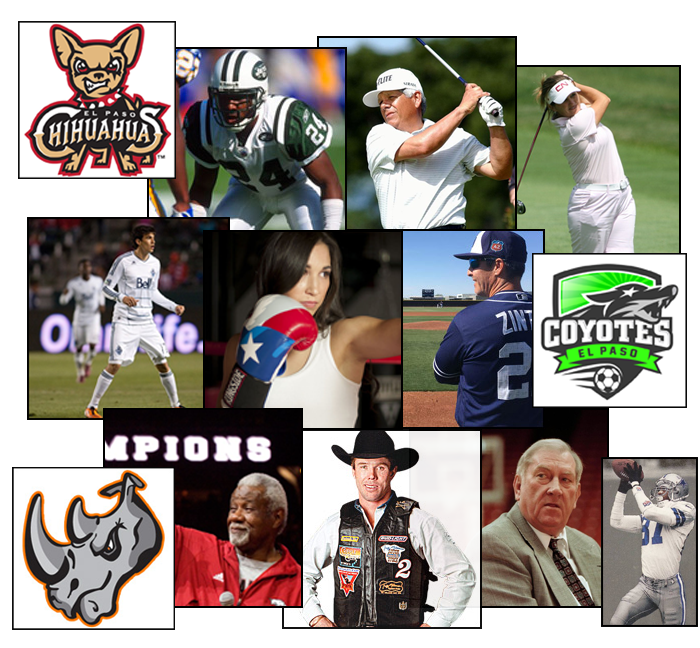 Other notable athletes from El Paso include World Champion boxers Jennifer Han and Austin Trout; Hall of Fame basketball coach Nolan Richardson; NBA star Nate Archibald; Olympian and track star Bob Beamon; World Champion and Hall of Fame rodeo star Tuff Hedeman; MLS soccer phenom Omar Salgado; NFL standouts Billy Davis, Ray Mickens, Don Maynard and Brian Young, among other El Paso and UTEP stars; MLB players Mark Grudzielanek, Alan Zinter and Omar Quintanilla; and so many more. El Paso is also home to various amateur and professional teams, including the El Paso Chihuahuas Triple-A Minor League Baseball team, the El Paso Coyotes MASL arena soccer team and the El Paso Rhinos Tier I Junior A ice hockey team, among others. With such an amazing sports history, El Paso is the heartbeat of the Southwest’s sporting community. Consider El Paso for your next tournament or event. Participants, fans and families will enjoy an amazing experience they will never forget.